the tank or tanks rise creating a low flow or high pressure condition. The standard TFS is housed in a powder coated weather proof metal enclosure with inbuilt pressure switches for ease of installation and are available in many standard or special combinatons to suit most applications. 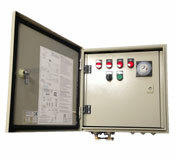 Economy versions are also available in plastic enclosures with external pressure switches. The standard unit housed in a powder coated weather proof metal enclosure with all control switches and indicators behind a lockable door incorporates a motor starter for the pump, 48 starts per day time clock, stop pressure switch, low pressure switch, Man-Off-Auto selector, low pressure indicator, high pressure indicator & time delay to by-pass the pressure switch at start. The TFS can also be used as an irrigation system to water every day for a pre set time with low or high pressure protection. Transformer for 24 Volt ac supply to external circuits. Flow switch circuit with time delay for stopping on low flow. Vacuum switch for loss of prime. Two probe circuit to start and stop on probes and time. Various starting methods, like Direct on Line, Star Delta, Soft starter, Auto transformer or Variable speed drive can be supplied for small or large kilowatt motors in standard models.